Suitable for Mum, Dad, Grandad, kids, friends, families, also couples or solo thrill seekers. 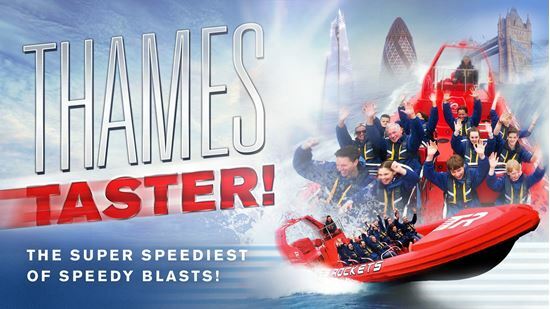 The Thames Taster is the all speed super-fast speedboat ride that will satisfy even the greatest of appetites. Step aboard our lightning quick Rockets at St Katharine Pier in the shadow of the iconic Tower Bridge. Take a slice of the #1 speedboat experience in the UK with a 15 minute all-speed dash around the docklands and Canary Wharf. Powering through the wake and bouncing across the waves. Take in the sights from Tower Bridge to the iconic One Canada Square and back again, together with with our trademark soundtrack pumping through the speakers. Whet your appetite with a healthy spoonful of what we do best. Fly at 30 knots through the most famous city in the world. With twists and turns that will even exhilarate Grandma – this really is the bite-size taster for all! Carve your way to high octane heaven. Served up in equal measure are comfort and exhilaration all due to your guide. They're always ready to assist with above all a side dish of good-natured humour. The Thames Taster is ready for service. Why not add a Dim Sum lunch to your Thames Taster with nearby favourites Ping Pong? Perfect to squeeze into those busy sightseeing days! *Thames Taster trips are available Friday, Saturday and Sundays departing from St Katharine Pier. Fabulous trip-do not miss this !! Been many times to London but never tried this and it's highly recommended. Amusing tour guide it's just the right note and when speed and music kick in its fantastic fun. Was dusk when we started definitely best time of day as Thames is well lit and all seems extra exciting. My 11 yr old niece loved it too !! "Exhilarating fun and great value"
From the moment we arrived and throughout the trip we were very well looked after by our guide Dave and pilot Ian. Great and funny commentary by Dave and he even made the safety briefing entertaining too. The sensation of the wind whipping your face as you zip across the water leaves you feeling exhilarated and refreshed Catchy music soundtrack too, with the inclusion of a “Titanic” track being rather amusing too. Highly recommended for families.